Nathan Meunier's Up Up Down Down Left Write and Dan Amrich's Critical Path are currently 50 percent off digitally at Amazon. 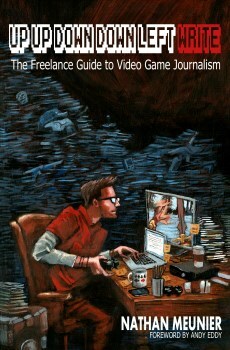 Back in July, Nathan Meunier, an alumni of the Escapist news crew, published a book of advice for aspiring videogame journalists titled Up Up Down Down Left Write. It was a entertaining and insightful look at the process of writing about games for a living, and a read that we'd definitely recommend if you've ever considered dipping your own toes into the world of freelance games journalism. To that end, we're happy to report, in keeping with the ongoing madness of Black Friday, that Mr. Meunier's book can currently be picked up for half of its usual price on Amazon. Likewise, writer Dan Amrich is also selling his games journalism opus, Critical Path: How to Review Videogames for a Living, at a similarly hefty discount. In short, as long as you're fine with e-copies, you can buy them together for under $10. Both books will be on sale for the duration of this Black Friday and Cyber Monday. Coming from someone who's read Nathan's book and also has to contend with the frequently contentious waters of freelance living, I can attest that these books are invaluable resources if you seriously plan to do this kind of work. Even if you're good at what you do there are always things you won't think of, angles you might not naturally approach and considerations that you'll pass over. Having a guide there to point these things out to you before or even after you've reached the professional level is well worth the price you're being asked to pay.